The flight into Salzburg from Frankfurt is no problem at all. You can also fly into Munich and then take the train to Salzburg, which is 1.5 hrs. the train directly from Munich's central train station is 1 hr. The Train Station is just North of the Congress center and is an easy walk (10-15 min or less) South down RainerStraße to Mirabellplatz. Once you get off the plane you can take either a cab or the bus. 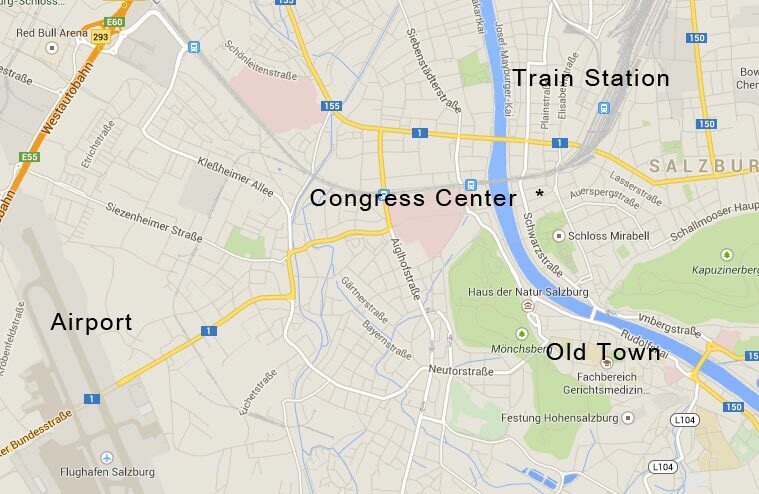 If you take a cab it will cost you about 15-20 Euros to get to the Congress Center. If you take the bus you will need a ticket. They are inexpensive, and can be purchased in the magazine shop (General Store) inside the airport. Ask for a bus ticket. It is less than 2 Euros. Then you will want to get on the #2 bus headed to town (going right, if your back is to the airport). Even if you get on the #2 bus going the other direction it makes a fairly quick loop back. It will take about 20 minutes before you pass the train station. Soon after that (2-4 minutes) the Congress Center will be on the right.